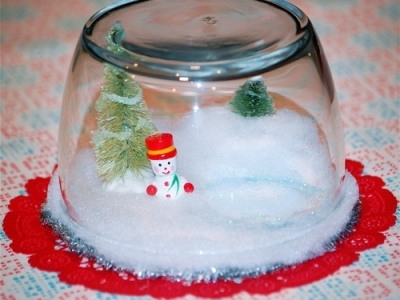 Use recycled baby food jars to make these adorable snow globes! 1. Wash and dry your jar completely, including the lid. 2. Attach figurine to inside of jar lid using florist clay. If you are using a small object, it's a good idea to build up the clay so the object will appear taller. To preview, simply place empty jar over the top of your figurine to see if you have the height where you want it. Attach any optional items with the clay (greenery, berries, etc.). Important: Use your imagination, but make sure whatever you use is waterproof and won't dissolve. 3. Fill jar with water to within 1/2 inch (1 cm) of top. Use cold water. Warm water tends to cloud. Sprinkle ½ teaspoon of glitter, or “ snow” into water. This measurement is based on a medium to large baby food jar. Adjust glitter amount according to your size jar. 4. Using hot glue gun, line inside of lid with glue. Insert figurine in water and screw on lid. 5. Dab lid dry if any water dripped or spilled. Apply a layer of hot glue around the rim of the lid to seal shut. 6. Let stand and dry overnight -- lid side up. 7. Decorating the lid rim is optional, and there are several ways to do it. Attach decorative ribbon with glue, use plastic holly berries for a holiday feel, or use colored felt as we have. This can be as simple or as elaborate as you like. Use white or craft glue to run a squiggly line around the felt then sprinkle with glitter and let dry. Glue on buttons, use stickers, or personalize your globe by writing your name in glue and sprinkling with glitter. You may also paint the lid rather than use ribbon or other embellishments. The possibilities are endless so have fun!